Monitors the thermal sensors in most modern Macintoshes, to let you see the thermal performance of your system. Provides real-time and long-term graphs. Supports multiple sensors on systems equipped with them without any special drivers or kernel extensions. The disk image of ThermographX is available for download (1.8MB). A powerful battery monitoring utility for all Mac laptops, this Universal Binary application provides easily customizable graphs of various battery measurements, including battery charge, voltage, and full charge capacity. The disk image of XBattery is available for download (1.0MB). I also offer several OS 9 utilities for older Macintoshes. BatteryAmnesia A utility designed to eliminate the "memory effect" in NiCad or NiMH PowerBook Batteries. Read more. ClockSync A simple utility to synchronize the clock of multiple Macintoshes. Useful in publishing and document management environments. Read more. Jeremy's Control Strip Modules A collection of Control Strip Modules, including a clock module, battery module, temperature measurement module, and more! Read more. Insomniac Allows scheduled wakeups on laptops. Read more. MyBattery Battery monitoring utility for Mac laptops. Read more. NetChronometer Synchronizes your Mac's clock to an internet time server. Read more. 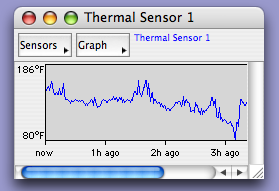 Thermograph Temperature measuring utility on Macs with temperature sensors. Read more. Threshold Lets you set when the low battery warning appears on old PowerBooks. Read more. PowerSaver Tweak Provides more control over the power saving features on older Mac's. Read more. WebChecker Monitors web pages and notifies you when they change. Read more.